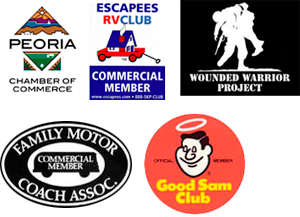 Fix My RV, located in Peoria, Arizona, knows a lot about RVs. From antenna repair to AquaHot system maintenance, we can do it all. RV-ing is becoming a more popular mode of travel and leisure in today’s modern times. For guests coming into the Peoria, Phoenix, Scottsdale area from out of town, here are some interesting facts you may now know bout Phoenix. Phoenix has NO Daylight Savings Time. So you may not suffer through waking up an hour earlier, but you also don’t get afforded one day to sleep in an extra hour. 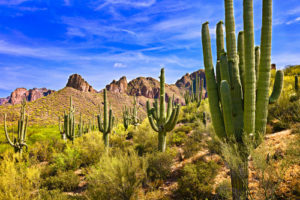 Phoenix sits in the Sonoran Desert – one of 4 North American deserts. Arizona, Phoenix’s home state, is the only state to have part of all 4 deserts within it’s borders. Speaking of the Sonoran Desert, this North American desert is the only one that hosts the saguaro cactus. You know those big cacti from the movie that are over 50 feet tall? Yep, those cacti. They can live to be 200 years old and might help you place where a desert-based movie was filmed. Though Phoenix is in a desert, it’s not actually at sea level. Phoenix’s elevation is 1,117 ft above sea level. Phoenix is regarded as the sunniest metropolitan areas in the United States. Of the 365 days in a year, the average is 334 days of sun a year. Phoenix is the 6th largest city in the U.S.
15 Major League Baseball teams have spring training in the Phoenix area. This is 50% of the teams in the MLB. Phoenix experiences at least 3 haboobs each year. What’s a haboob? The largest and most dangerous type of sand/wind/dust storms that can last for about 3 hours. Phoenix has more than 200 golf courses and has been named one of the top golf destinations in the world. Sky Harbor, Phoenix’s airport, is the 10th busiest airport in the nation. We sure are proud of our town and our state. When you come to visit in your RV, come visit us before you head out of town. We’ll fix anything from plumbing systems to AquaHot problems. Call Fix My RV for all your RV needs!